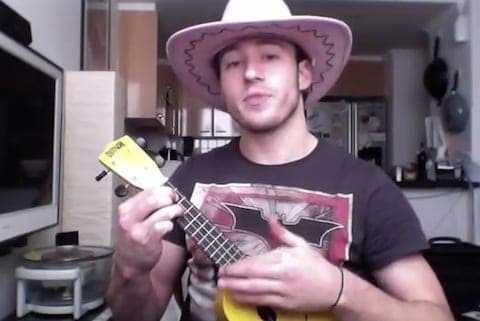 Procrastinating before his end-of-semester exams, Australian 2008 Olympic champion diver Matthew Mitcham performs Dolly Parton’s "Dumb Blonde" with his ukelele. We’ve previously featured Mitcham performing "Single Ladies" on his YouTube channel. Mitcham gained media coverage in 2008 because reporters thought he was the first openly gay Australian to compete at the Olympic Games, an honor which was actually taken by diver Mathew Helm who won the silver medal at the 2004 Summer Olympics in the men's 10m platform.